Welcome to ScientificWrestling.com, the VERY Best in Catch Wrestling! LEADING THE SPORT OF CATCH-AS-CATCH-CAN WRESTLING REVOLUTION SINCE 2003! Since 2003, Scientific Wrestling has blazed the trail providing world-class instruction and competition for the sport of catch wrestling. We were the first Catch-As-Catch-Can wrestling organization of its kind and we continue to lead the way providing top-of-the-food-chain coaching, competition, and camaraderie for both aspiring and accomplished grapplers from all walks of life. We live and breathe the entirety of the sport; from its rough & tumble origins to its evolution into modern grappling and "sports entertainment" and to our own NO-HOLDS-BARRED King of Catch Wrestling competitions. Scientific Wrestling sincerely appreciates your loyal support over all these years. We couldn't have don't it without your belief in our mission, thank you! Includes explanations of the methods of catch-as-catch and is accompanied by clear illustrations that show how to use them most effectively, and the background of this unique sport is traced through America, Japan, and England. 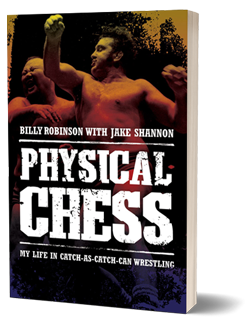 In this fascinating autobiography, Billy Robinson recounts his upbringing in post-WWII England amid a family of champion fighters, his worldwide travels as a wrestler, his time as a pro wrestling TV star, and his career as a coach to some of the biggest names in mixed martial arts. The Fighting Library! 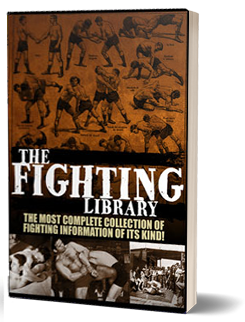 : THE MOST COMPLETE COLLECTION OF FIGHTING INFORMATION OF ITS KIND! Forget everything else you think you might know about martial arts. Jake Shannon from Scientific Wrestling has compiled out-of-print classics from his private Western Martial Arts library, along with other original items he has uncovered, PLUS several exclusive interviews! 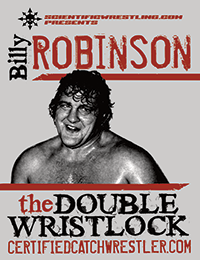 This DVD is a game changer, learn the bread and butter hold of REAL catch-as-catch-can with the LEGENDARY Billy Robinson. This 45 minute long crash course in how to apply the feared catch-as-catch-can finishing hold, the Double Wrist Lock, will change the way you think about grappling. It's is loaded with practical and little know tricks that will take your game TO THE NEXT LEVEL! 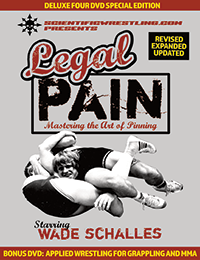 Wade Schalles' LEGAL PAIN DELUXE 4 DVD SET. For those of you who know of Wade Schalles and his astonishing career as an athlete and coach, you know he knows pinning. This new DVD course successfully updates the Wade of 25 years ago with the Wade of today in an all inclusive and entertaining package focused soley on the art and science of PINNING! Josh Barnett has proven himself time and time again against the world's toughest competition. A former UFC Heavyweight Champion,King of Pancrase, and Metamoris champion, Josh stands at the top of the MMA food chain. 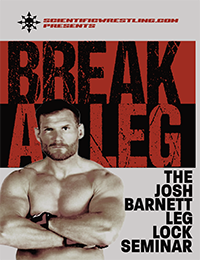 In this stellar nearly ninety minute long seminar, Josh shares never before seen methods to set-up and finish one of the most popular submissions in modern grappling and Mixed Martial Arts - "The Leglock"
Join the World's Best Online Grappling Membership Site! An instant 20% discount on all DVDs! Scientific Wrestling PIN & SUBMIT seminars feature the greatest grappling coaches on Earth! Our Highly Acclaimed PIN & SUBMIT Seminars will BLOW YOUR MIND! Training with Scientific Wrestling has ALWAYS meant training with the best. Our coaches and former camp attendees have included world-record holders, champions, and athletes from UFC, PrideFC, WWE, UWFi, Pancrase, UWW (formerly FILA), USA Wrestling, NJPW, and more. Now YOU can bring the Scientific Wrestling experience directly to you. Booking a Scientific Wrestling PIN and SUBMIT Training Camp for your fight gym, wrestling organization, MIL/LEO agency, or martial art school offers your facility the opportunity for increased visibility and improved retention by bringing our legendary coaches and proven, top-of-the-food-chain competitive CACC techniques and strategies. Scientific Wrestling paved the way for the first CACC competitions in nearly 100 years with our King of Catch Wrestling open tournaments in 2007. 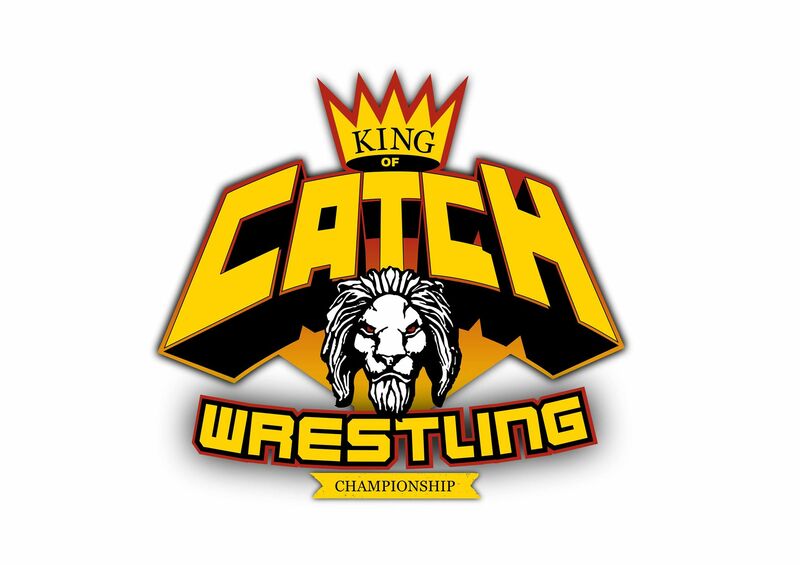 Scientific Wrestling also developed the first Coaching Catch-As-Catch-Can certification (formerly known as the Certified Catch Wrestler program) and the ONLY CACC coaching program co-developed by Billy Robinson himself! Additionally, we were the first to introduce the Macebell, the very first modern steel Gada, instructional, and certification program for combat sport strength and conditioning. "Honest, Hardworking, Strong Character, Creative, & Energetic... Wow. Jake you're on a roll with this certification! I support you wholeheartedly my friend." - Mark Schultz, Olympic Gold Medal-winning wrestler, successful UFC competitor, 2x Freestyle Wrestling World Champion, and 3x NCAA Wrestling Champion. "JAKE, YOU ARE THE VERY BEST INDIVIDUAL PERSON TO COME ALONG IN THIS GENERATION AND DO WHAT YOU HAVE DONE FOR WRESTLING, I CAN'T FIND WORDS TO EXPRESS MYSELF. MUCH RESPECT" - Billy Wicks, Catch-As-Catch-Can legend and retired law enforcement officer. 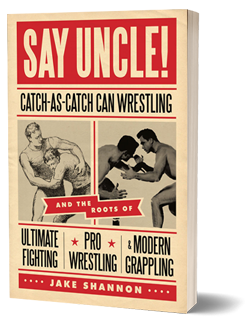 "Jake is Southern California's true master of catch wrestling. Merely shaking hands with this gentleman can bring about an infinity of pain!" - Bob Calhoun, co-author of The Godfather of Grappling and author of BEER, BLOOD & CORNMEAL! "I just want to say thank you for your great class. It was easy to understand and implement the adjustments into my style. What I enjoyed most, were the submissions and how they fit into my wrestling. In my first grappling tournament, I followed the class instruction and used the double wrist lock that Billy taught to submit my opponent in my first championship match. Then, in my third place match, I used the cradle ankle crank. Both times, my opponents did not see these moves coming, and they both fit right into my natural style. I'm excited to master the other submissions taught." - Jeramy Hunt-Loveless, Veterans US Freestyle Nationals 2010 Champion. "My head's still spinning from all the game changing knowledge that was dropped at this years Scientific Catch Wrestling Seminar this past weekend. Jake Shannon and Wade Schalles' Catch Wrestling Seminar was totally game-changing. It's only a question of time until this explodes onto the MMA scene and evolves… taking MMA to the next level. It works, which means it's just like a force of nature… it can't be stopped. It's that simple. "- James "The Colossus" Thompson, PRIDE FC and Bellator veteran.